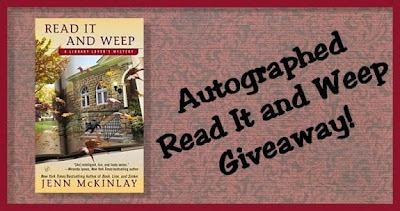 Win an Autographed Copy of Read It and Weep! To enter, send me an email. You can click the "Contact" tab at the very top of my blog header. The subject line of the email should read "Read It and Weep Giveaway." The email must contain (a) your email address, and (b) your name and mailing address. Couldn't get much easier, could it? Easy is good. Easy I like. Just remember: if your email does not contain the items listed in numbers 3 and 4, you will not be eligible for the drawing. I will reply to everyone's email so that you will know your entry was received. The winner of the drawing will be announced here on the blog Friday, November 29. And just in case you wonder-- once the giveaway is done, your emails will be destroyed. I am not in the harvesting business, since the only thing I would be able to do with your info is send you a Christmas card... and I don't think I ordered enough to do that... and I'd need more stamps! Here's your opportunity to read a fun new cozy. Take advantage of it! Cathy - Thanks for offering this - what fun! And thank YOU for spreading the word even further on Twitter. Most appreciated! Thanks for the chance to win - and for making this international! I'm glad you entered, Debbie, and whenever I have a giveaway (which will happen a bit more often in future), it will always be international. Always! :-) Good luck! the contact tab is not working, I get a message that it is not functuing.